When concrete cures at high temperatures it has a high rate of evaporation, causing unwanted blemishes and cracks. Curing at high temperatures can also diminish the concretes strength and durability. Since concrete naturally produces heat as it cures, you can imagine that placing a material that has internal heat on a hot day is quite challenging. 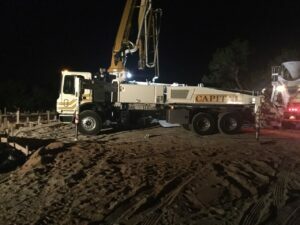 Getting the concrete in place before sun up also allows the foundation workers to conduct the labor-intensive screeding (leveling) process before it gets too hot outside. Remember, they aren’t only working in the heat of the sun, but they’re also working on a surface that is exuding heat itself. For optimal results, concrete should be put in place within 90 minutes of loading the truck. Depending on the proximity of the mixing plant to the final destination, this can be a big challenge. Add to that equation the increased congestion in a growing city like Austin, Texas, and you can see another major advantage to starting so early. No traffic jams!! 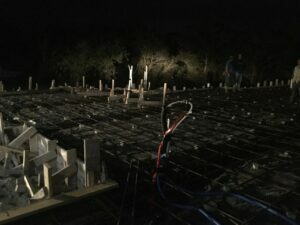 At Sterling Custom Homes, we’ve been pouring foundations in Austin, Texas since 1989. We carefully plan and schedule every aspect of your custom home construction to ensure the quality and durability of the finished product. From site work to foundation to framing to finish out, there is no substitute for the quality and expertise that we apply to every home we build. To learn more about our unique custom homebuilding process, please contact Gary Grambley at gary@sterlinghome.com or call 512-263-2214.